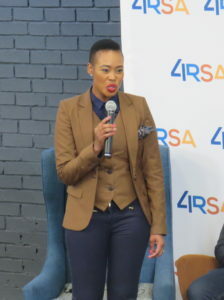 Minister of Telecommunications, Stella Ndabeni-Abrahams. The launch of South Africa’s first digital economy summit, endorsed by Cabinet, took place in April at the Wits Tshimologong Digital Innovation Hub and featured a keynote address by the Minister of Telecommunications, Stella Ndabeni-Abrahams. The summit is due to take place at the end of June 2019. “As we unpack the critical components of 4IR, it is important that people are placed at the centre of the conversation. As government, this is woven into all our 4IR interventions, and as such, we have been deliberate in seeking collaborative efforts that build a capable 4IR army. In the same breadth, we must ensure that we create and own solutions that respond to our unique requirements as a country. Lastly, it is imperative that all sectors find expression in the 4IR conversation,” said Ndabeni-Abrahams. Wits University is a founding partner of 4IRSA, a partnership that aims to stimulate and facilitate an inclusive national dialogue to shape a coherent national response to the Fourth Industrial Revolution in South Africa. It aims to complement and support other national activities relating to the 4IR, most notably the Presidential Commission on the 4IR. The 4IRSA partnership was founded by the Universities of the Witwatersrand, Johannesburg, and Fort Hare, with Deloitte Africa joining as a facilitation and knowledge partner and the Department of Telecommunications and Postal Services as the public sector partner. As the initiative grows, it will include more participation from government, labour, business, civil society and researchers. “The 4IRSA partnership is really important because it is a spontaneous and growing alliance between enthusiastic and concerned partners in industry, academia and government, together with social actors and citizens, who are committed to working together to develop a coherent, inclusive national response to the Fourth Industrial Revolution in South Africa,” said Professor Brian Armstrong, who is the secretary to 4IRSA and Professor of Digital Business at the Wits Business School.